I was wondering about the double jeopardy parameters of the various felony larceny offenses today, so I did a little research and tripped across the Hudgins decision. The answer is, all felony larcenies can be charged side by side if they apply to the same act. Let's work through an example of this. An inveterate thief in Pitcairn County steals a Rhodesian Ridgeback puppy worth $1,000. There are three possible charges here. Under 18.2-95 (grand larceny), stealing something worth more than $200 is a felony punishable by up to 20 years in prison. Under 18.2-104 (subsequent larceny), a third or subsequent larcenous offense is a felony punishable by up to five years in prison. Finally, under 18.2-97, stealing any dog is a felony punishable by up to ten years in prison. Typically, the thief will just get charged with grand larceny. However, under the Hudgins decision, although they all arise out of the same act and each have the same included lesser crime (petit larceny), the thief can be charged with each crime because each has a separate element. 18.2-95 has a value element. 18.2-104 has a multiple priors element. 18.2-97 has a dog element. Real world applications of this are interesting. In a great number of cases wherein the defendant is charged with grand larceny he could also be charged with subsequent larceny. However, once the value of the stolen item is established as at least $200 everyone just defaults to grand larceny. Grand larceny carries the greater punishment. It also has a greater effect on the sentencing guidelines - especially if the defendant has enough of a criminal history or has currently committed enough offenses to bypass worksheet B and go to worksheet C. This means that as a binary decision - requiring a choice of either grand larceny or subsequent larceny - there is an advantage to charging grand larceny. Also, in a binary decision, the only real advantage to charging subsequent larceny is one at trial. In Virginia, the courts have a clear line of precedent which does not allow the defendant to stipulate that predicate convictions have occurred. Therefore, in trial the Commonwealth can introduce all of the defendant's prior larcenous convictions in order to prove the element of prior convictions. Yet, since most larcenies are pretty cut and dried and don't actually go to trial, faced with a binary choice law enforcement and prosecutors would not choose subsequent larceny. But, it's not a binary decision. When charged at the same time the prosecution gains the advantage of both the greater punishment and guidelines for grand larceny as well as the trial advantages of subsequent larcenies. I'm not sure why we don't see more of this. Perhaps there is a continuing pre-Hudgins perception that since both contain the lesser offense of petit larceny that they cannot be charged contemporaneously without violating double jeopardy. Holland was in federal custody on November 2. On that date, without presenting evidence, he got the trial judge to suspend his sentence pending a hearing to determine whether his active sentence in Virginia should be suspended. On November 3 Holland was transferred to the Virginia Department of Corrections. In a subsequent hearing the trial judge declined to reduce Holland's sentence and imposed the 18 months he had suspended in the previous order. Holland presented the Court of Appeals with a clever argument. On November 2 the trial court had jurisdiction. On November 3 the trial court did not have jurisdiction. Therefore, the trial court could not change its November 2 order and the suspension of the sentence must stand. Now, that is a creative and novel way of looking at the statute. It turns the purpose of the statute on its ear and has the advantage of being correct. The judge had no jurisdiction to act on Holland's sentence after November 3. Even the appellate court rules that the judge had no power to do so and therefore any orders from the trial court after November 3 are void ab initio. Unfortunately for Holland his three judge panel on the Court of Appeals included Judge Robert J. Humphreys, perhaps the most consistently clever of Virginia's appellate judges. Judge Humphreys doesn't stop after declaring the post-November 3 trial court orders void ab initio. He then goes on to examine the November 2 order. Looking at the plain language of the statute, Judge Humphreys declares, "In addition to permitting the exercise of jurisdiction over a defendant who has not yet been transferred to the custody of the DOC, Code § 19.2–303 clearly requires that before a sentence may actually be suspended or modified, the circuit court also find (1) that suspending or modifying the unserved portion of the sentence would be compatible with the public interest, and (2) that there are circumstances in mitigation of the offense." He then points out that there was no evidentiary hearing and therefore, the judge could not have made either of these findings. Holland doesn't give up. He apparently argues that his motion carried evidence in it, but Judge Humphreys shoots that down, quoting case law that states a motion is just allegations. Then Holland tries to argue that the trial court implicitly made those findings when it entered an order suspended the sentence on November 2. However, Judge Humphreys shuts that down - pointing out that the trial court had scheduled a hearing to take evidence and thus there was no implicit findings because there was no final ruling. Judge Humphreys concludes that the transfer of Holland to the DOC rendered the November 2 ruling voided by operation of law. Clever argument and clever ruling. I wish more opinions were as interesting as this one. Holland v. Commonwealth, OCT13, VaApp No. 0965-12-3: (1) Per the statute, the trial judge loses jurisdiction to suspend any part of the sentence once the individual has been transferred to DOC. (2) Once an individual has been transferred from federal custody to Virginia DOC the trial judge loses jurisdiction to suspend the Virginia sentence. (3) Any order purporting to suspend an individual's sentence after the defendant has been transferred to DOC is void ab initio. (4) Before suspending part of a previously imposed sentence under the statute the trial judge must find (a) that suspending or modifying the unserved portion of the sentence would be compatible with the public interest, and (2) that there are circumstances in mitigation of the offense. (5) When a trial court suspends the imposition of a sentence pending a 19.2-303 hearing has not implicitly found the two conditions needed to suspend the sentence. (6) Once an individual has been transferred to DOC an order suspending imposition of his sentence pending a 19.2-303 hearing is void. Last Friday, in Starrs v. Commonwealth, the Virginia Supreme Court yet again affirmed that trial courts have the ability to take cases under advisement on their own initiative. 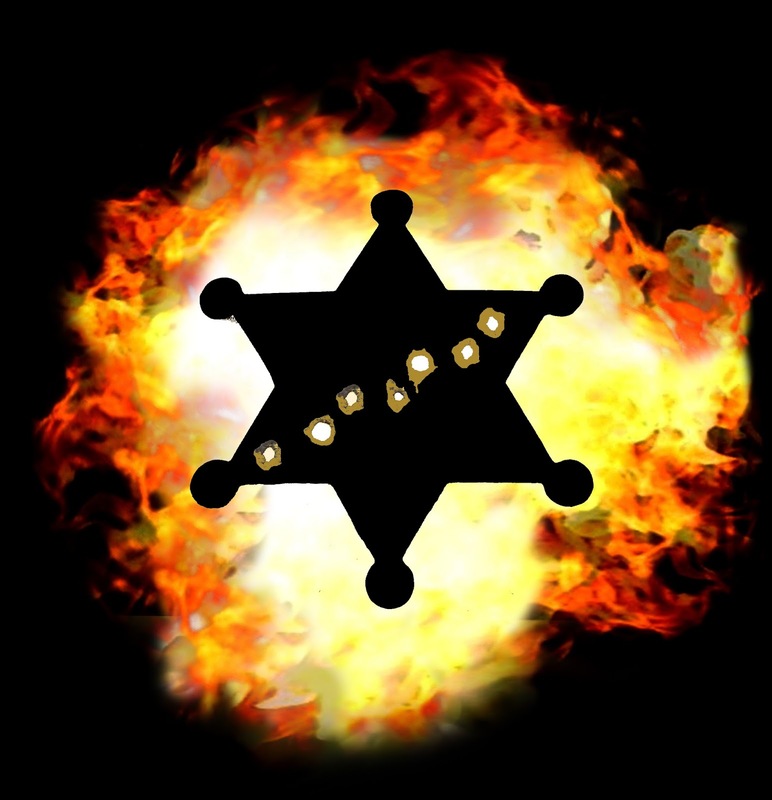 In Starrs, the defendant pled guilty and the trial court found evidence sufficient to convict. The defendant then asked the judge to take the case under advisement for two years and dismiss the case after that two years (assuming no further trouble). The trial court found that while it could continue the case for two years it had no power to dismiss after that two year period. The Virginia Court of Appeals upheld the trial judge, ruling that once facts sufficient for a conviction have been found a trial judge must convict the defendant of the charged offense. Then the case went to the Supreme Court. The Supreme Court, via Chief Justice Kinser, ruled that facts having been found sufficient for conviction is not the same as judgment. While it is primarily discussing the fact that a defendant's acquiescence via a guilty plea is not judgment, the opinion also specifically states that the finding of guilt by a jury is still subject to judgment from the trial judge. Specifically, the Supreme Court finds that after entering in the record that the defendant has pled guilty a trial court retains "the inherent authority to withhold a finding of guilt, to defer the disposition, and to consider an outcome other than a felony conviction." There are two interesting points to the Supreme Court's decision. 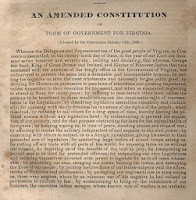 The first is that the Court bypassed all the common law and statutory arguments and rooted this decision in Virginia's Constitution and the courts' inherent powers to judge under the constitution. Once a trial court has entered a judgment of guilt it must follow the laws passed by the General Assembly in sentencing the defendant. However, prior to actual judgment the judge has discretion as to how to decide a case - even if the defendant has admitted guilt. Admittedly, that's even beyond what I had argued for. I had argued that advisement was a common law procedure which had not been abrogated by the General Assembly. The Supreme Court's ruling is that advisement is a constitutionally grounded inherent ability of trial judges. Unless I mistake my reading, that puts it beyond the ability of the General Assembly to reach via statutes. Mind you, judges are still subject to appointment and reappointment by the General Assembly, so they are still required to prove to the members of the General Assembly that they can be trusted with this power. Nevertheless, the power seems to be out of the direct reach of the legislature. The second point is that the decision doesn't lock things down entirely. Because this particular case is based upon a guilty plea it leaves open argument that it does not apply in other situations. However, while I am sure the argument will be made, it strikes me as spurious. To begin with, the Supreme Court does note that a judge must render judgment even after a jury has rendered a verdict, although it is not a part of the opinion vital to the decision. Logically, if the judgment isn't rendered until the judge renders it, the manner in which facts are found is not relevant as to the judge's actual inherent power in rendering the judgment. Conclusion: Having argued for a long time that advisement exists as a common law practice, this decision leaves me a little ambiguous.Where does this leave the statutes which the General Assembly has already passed regulating the use of advisement in particular cases such as misdemeanor property offenses, domestic assault and battery, and drug possession? By definition, these statutes relate to punishment and can only go into effect after the judge finds a defendant guilty. Prior to a finding of guilt the trial judge has the inherent power to take the case under advisement under terms and conditions of his own. This would seem to make the statutes at best a "sense of the General Assembly" or second chance statutes. If the judge refuses to take a case under advisement, the defendant gets a second chance at a deferment of his sentence and possible dismissal of his charge via the direction of the General Assembly. At worst, this ruling may make these statutes an unconstitutional infringement of the legislature on the courts' inherent constitutional power. This last seems unlikely and my personal opinion is that the courts will basically follow1 the statutes in those places where the General Assembly has laid out how it believes advisement should occur. We may not have seen the end of litigation concerning this issue, but this case looks like the death knell for arguments against advisement. 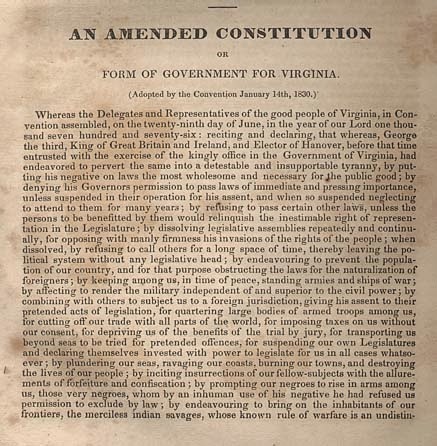 Short of a change to the Virginia constitution, neither the Court of Appeals nor the General Assembly can directly strip this power from the trial courts. However, I suspect this decision will make the interviews which judges go through before they are (re)appointed by the General Assembly much more interesting. In one fell swoop, Chief Justice Kinser has swept away all the bad law which has come out of the Virginia Court of Appeals concerning the taking of a case under advisement. This doesn't mean the fight is completely over. Certain quarters will continue to press for the General Assembly to eliminate advisement and there is still some room to argue when exactly the Supreme Court has agreed that advisement exists and what exactly a trial judge can do after he has taken a case under advisement. The background: Taking a case under advisement has been around for a long time in Virginia jurisprudence. However, it was a judicial practice, neither specifically approved nor disapproved by any law which has passed the General Assembly. It is the practice of a judge taking evidence, but not immediately finding guilt and imposing a sentence. Instead, the judge sets the case aside for a period of time, sometimes requiring the defendant to just keep the peace and other times requiring some act from the defendant. After the period of time has passed, the judge - if everything went as he required during the set aside time - reduces the charge to a lesser offense, gives a lesser sentence than would otherwise have been given, or dismisses the charge. Usually, the judge does this with the agreement of both parties. Nevertheless, it is something the judge can do himself, without either party's acquiescence. Whether the solely judicial advisement process is a good thing or a bad thing probably depends on your perspective and the facts of the particular cases to which it is applied. Personally, I think it is an equitable release valve which allows a judge to bring some sanity to situations wherein a young prosecutor might be a little too eager to crucify every jaywalker or situations wherein public opinion is such that elected officials might be forced into taking an overly-draconian stance. Of course, this can also lead to a great amount of frustration or out and out acrimony as a prosecutor proves his case, but sees his entire purpose in prosecuting the case frustrated by a judge who basically says, "Yes, he's guilty, but I shall not find him so because . . ."
The first arguments I heard against advisement seemed to appear about ten years back. A small, but vocal, group started claiming that because the General Assembly had passed laws specifying how advisement could be applied in particular situations advisement was not authorized in any others. It was a weak argument1 and pretty clearly a minority position, but where it gained resonance it found true believers. One of those places was the Virginia Court of Appeals. This is the third time the Virginia Supreme Court has bounced attempts to get advisement declared illegal. First, back in 2008, came Moreau, which came directly to the Supreme Court from a circuit court and shot down a writ of mandamus requiring a judge to not use advisement, but to find guilt and sentence immediately. Next came Hernandez, in which the court specifically found a trial court could take a case under advisement, but left open-ended what the judge could do at the end of the advisement. Hernandezv. Commonwealth, JAN11, VaSC No. 092524: (1) Until the court enters a written order finding the defendant guilty of a crime, the court has the inherent authority to take the matter under advisement or to continue the case for disposition at a later date. (2) Once a judge has found someone guilty of a crime the punishment must be as laid out by the General Assembly. (3) A judge's statement that there is enough evidence to support a conviction is not a finding of guilt. (3) The VaSC makes no finding as to whether a case can be deferred/continued/taken under advisement with a promise of a particular disposition at a later date. Then Court of Appeals came back with Taylor and Starrs. Taylor v. Commonwealth, JUN11, VaApp No.2236-09-1: Upon a finding of facts sufficient for guilt, a trial judge does not have the power to reduce a conviction to a lesser offense or to dismiss it. Starrs v. Commonwealth, OCT12, VaApp No. 2516-11-4: After a finding of facts sufficient to find guilt, a judge cannot take a case under advisement for a period of time and dismiss the case upon completion of terms (unless a statute states she can). You may recall that I vociferously decried Taylor.2 However, for whatever reason, the Supreme Court did not address Taylor and by the time Starrs came out of the Court of Appeals I was convinced that advisement was gone and didn't even mutter much under my breath. After all, if the Supreme Court didn't bounce Taylor, which had all sorts of hooks which could have allowed it to be trashed, why would it go after Starrs, which basically said "we already decided this issue in Taylor." And then the Supreme Court heard Starrs and proved that I am terrible at precognition in the matters of appellate courts. 1. It was a corrupt form of inclusio unius est exculsio alterius. The argument was that the General Assembly by passing these statutes had excluded any other use of advisement. This argument fails on two levels. First, this doctrine of textual interpretation requires a list and there is no list stating that "Cases may be taken under advisement in the following situations . . ." The second is that it violates the rule of interpretation that requires statutes to be interpreted in harmony with existing common law unless the common law is clearly expurgated by a statutory law. So, what arrives in the mail today? 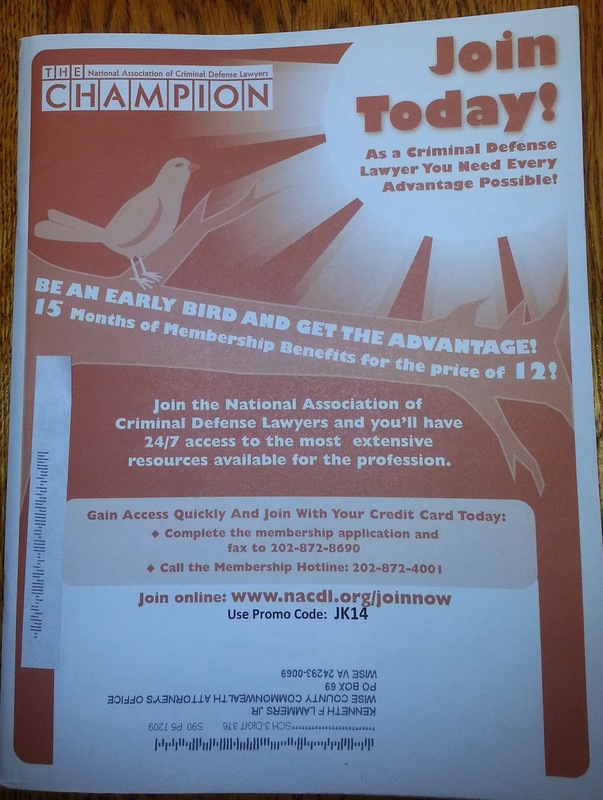 Yep, that's an invitation to join the National Association of Criminal Defense Lawyers attached to their magazine. Now, once upon a time I was a member, but for some reason my membership lapsed seven or so years ago. You'd think they might have gotten a clue as to why if they'd looked at the address they sent the invitation to. 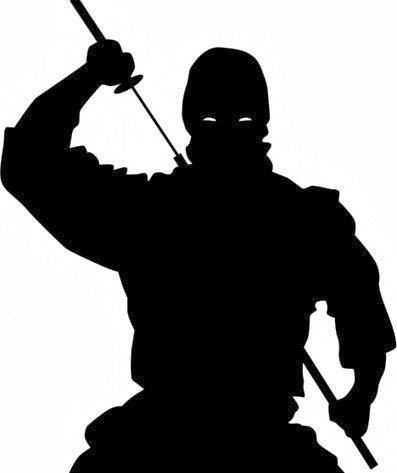 An entry need not be accomplished with ninja-like stealth to be furtive.